On a first, casual listening, these brisk, generally aggressive readings sound like "period practice" gone haywire. In fact, they represent a hybrid of historical and modern performance styles. The performers frequently make unconventional choices, but the aim is always to clarify the music's structures and enhance its expressive power. Thus, the bracing tempi that dominate BWV 1046 don't represent speed for speed's sake, but accommodate various musical details: the first movement's horn triplets, which can plod, make luminous sense here, and audible hemiolas set up the important cadences in both outer movements. The Adagio moves along forthrightly, with the oboe playing its little flourish near the close freely; the final chord, with its unexpected, unmarked swell and dramatic cutoff, skirts coarseness, but effectively propels the music into the following Allegro. In that movement's slow episode, the violin solo also has a flexible flair. The Menuetto's articulations vary on its returns, while its various alternating sections are rather interesting. The oboes fill in the repeats of the two Trios with elaborate, presumably written-out "embellishments"; those in the second Trio seemed, at first, a bit much -- inadvertently throwing focus to the pair of horns -- but they grew on me. The strings attack the Polacca's one forte phrase brusquely, especially the first time around -- old-fashioned elegance seems not to have been a high priority here -- but the move out of it is smooth enough. After this, BWV 1047's merely brisk tempi seem almost comfortable. The central Adagio again flows smoothly, though I wasn't convinced by the consistent dotting of one of the pairs of even eighth-notes -- the rhythms among the three solo parts no longer line up. The outer movements avoid the sewing-machine effect, thanks to purposeful crescendos and diminuendos -- well-chosen, judiciously applied, but definitely not part of the "period" expressive menu. There's a joy in the sheer motor activity of the finale as it winds into its finish. BWV 1048, for strings alone, is vigorously bowed -- alternating with odd bits of smoother articulation -- with keen rhythmic address; here and there, the basses land a cadence with an unceremonious thud. The Phrygian cadence separating the concerto's two "official" movements is unadorned, save for some discreet harpsichord scales. The finale contrives to maintain a feathery poise, even after the double-basses enter, and despite the basically driving approach. 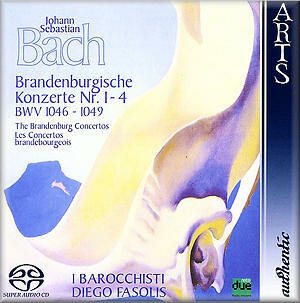 BWV 1049 may just be the best performance on the disc. In the first movement, there's no loss of energy or involvement, yet a distinct lean into the theme's "down-bars" produces a nice lilting grace that eludes the conventional, all-bars-created-equal rendition. The Andante, like the other slow movements, is direct rather than searching in manner, while the finale moves along smartly and musically. Significantly, I'd not thought much about the quality of the various soloists. They're all rather good -- although the trumpeter in BWV 1047 reduces a few of the trills to simple mordents -- without anyone's tone or phrasing standing out as exceptional. The unvalved horns in BWV 1046 have that familiar raw edge. The ripieno group's discipline is fine, if you don't mind the occasional bumptious moment. The Super Audio CD plays vividly in plain frontal stereo; given the forward recorded perspective, in fact, a slight volume cut might prove beneficial, depending on your equipment. A companion Arts disc (47716-8), to be reviewed shortly, completes the set of Brandenburgs, filling it out with the Concerto for Flute, Violin, and Harpsichord.